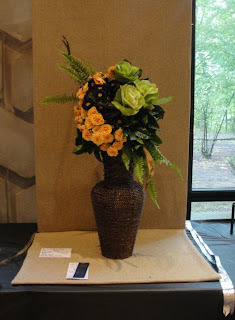 Many of you have followed my fledgling journey in floral design, starting with designing with daylilies and now venturing in to entering Standard Flower Shows with arrangements that are not predominantly daylilies. What a journey it has been!! You can read about my first experience here. I count nine books on my bookshelf on the subject (some from the early 20th century), three shelving units of "supplies" in my garage and too many ideas bouncing around in my head. You remember I had some sour experiences along the way, but never gave up on the idea that this was something that lit up my soul. 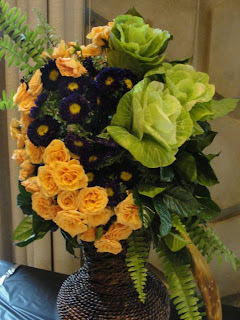 I have had the opportunity to train with the Creative Floral Arrangers Guild and each month the members get together, produce themed arrangements and critique each other. Yes, it is as intimidating as it sounds, but it is invaluable learning. 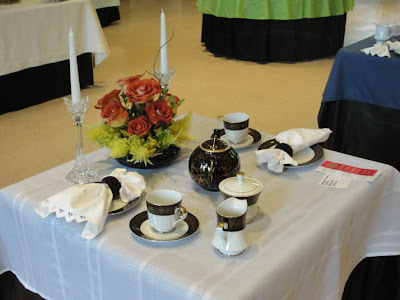 Four garden clubs in my area hosted a Standard Flower Show in September. On the right is a photo of the Horticulture sections, where exhibitors bring in stems, scapes or branches from specific plants. I didnt have any in this section this year, but plan on doing so next year. I chose to enter the Novice section, which required the creation of a Traditional Line-Mass design. 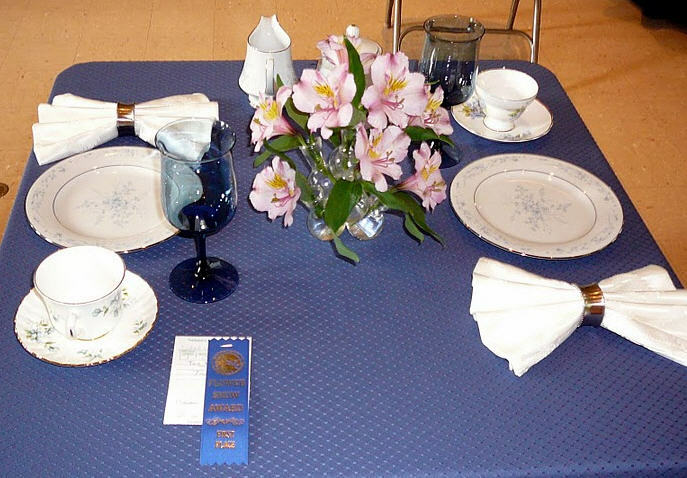 This section is for those exhibitors who have never won a blue ribbon in a Standard Flower Show. It seemed like a natural fit for me, since this was my first show I was not ready to come off the porch and play with the big dogs...yet. This design needed to be set against a 32" X 44" background, which I needed to supply. That doesnt sound like a big space, but once it was created, it seemed mammoth! MAMMOTH! My husband cut a piece of 1" pink sheet insulation to the required dimensions and I set out to find the perfect container and fabric for my design. 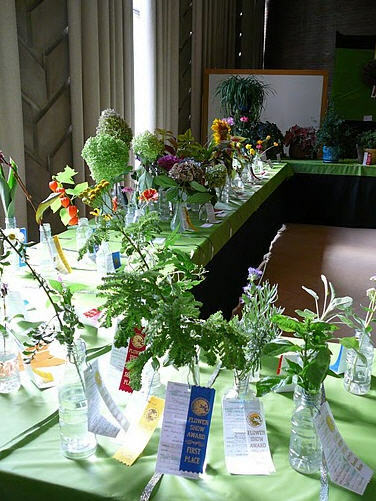 One of the benefits of belonging to some of these local clubs is the ability to gain admission into one of Michigan's premier cut-flower wholesalers, which is not open to the general public. ARE YOU KIDDING ME? Going to this wholesaler (not more than ten miles from my house) was so monumental that I took an afternoon off work to go pick out my flowers for the big show. Walking in to the warehouse, I felt like I had a big neon sign over my head that yelled - NEWBIE. No one really approached me to give me the lay of the land, so I wondered about acting like I belonged. Soon, I wandered back out into the lobby area, where I saw a woman- beautifully adorned in a floor-length puffy coat and clutching a steaming Starbucks. She walked over the the wall, and pushed a big, red button. 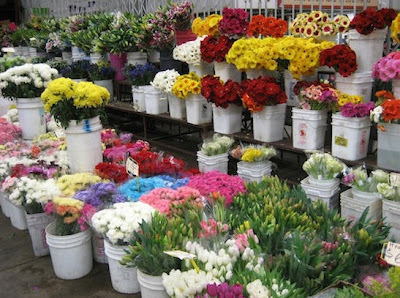 The wall opened up with a WHOOSH to reveal a large, refrigerated room filled, filled, filled with cut flowers and bursting with color. Never had I seen such an amazing room. It was straight out of the Willy Wonka World of Floral Design. I expected oompah-loompahs to come out singing an eerie tune, but that never happened. I resisted the urge to wail in delight. I watched as she entered, casually pushed another button on the other side, and the door whooshed closed behind her. I did press the button, finally, and walked in like I belonged there. I pressed it a second time to close it behind me, and the cold hit me like a snowball to the face. It was freezing! No wonder that girl had a floor-length coat and a steaming Starbucks, but at least I had pockets and a healthy bit of adrenaline to keep me warm. I didnt know where to look first. It really was nirvana. I saw roses in colors I didnt know existed, mums in exotic shapes and sizes, greens in hundreds of varieties, woody branches in bundles of all sorts, and thousands of other flowers and foliage. It was too much awesomeness to even put into words. Really. 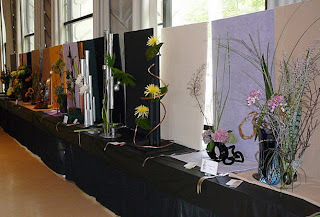 $123.00 and two frozen hours later, I was heading home with two large cartons of carefully packaged flowers in my car.The set up for the show was the next day, Thursday, and the actual judging was on Friday. That meant I needed to practice my designs that night at home then disassemble them, only to reassemble them the next night at the show location. My garage became my studio. Unpacking the cartons, I took inventory of the twelve different flower types, four different kinds of roses, and eleven different greens. Okay, maybe I bought too much. No need to dwell on the obvious. First Place win in the Novice Division! Finally, a blue ribbon! 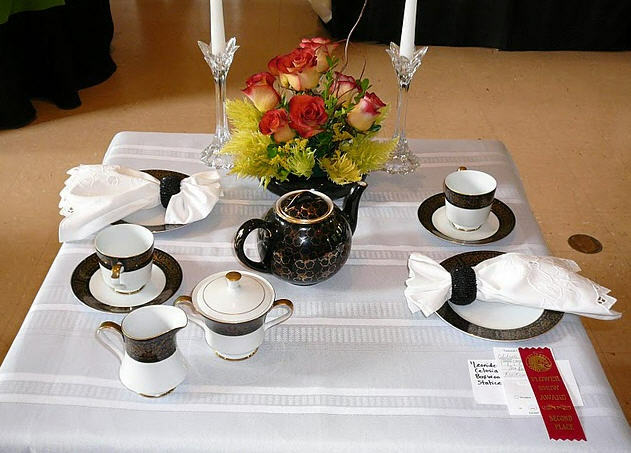 Second Place finish with my "Tea For Two" entry! I wrangled my colleagues from work to come along on our lunch hour to see what all the hub-bub was about. The good sports that they are, they all agreed to come along and see what I had done. The fact that they were going to see the results of the judging at the same time I would was a bit disconcerting, but it was worth them seeing the show, even if I had failed to place again. 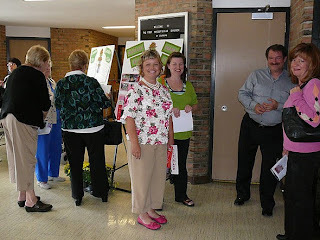 My husband, who has a very busy work schedule also made time to go to the show and see my entries. As you see in the photo on the left, we waited patiently for the doors of the show to open. We tried to peer through the windows to see the awarded ribbons to no avail. I had worked so hard, researched so diligently, and prepared as much as a could. I hoped for a good result, and had vowed to throw in the towel on designing if I didnt manage to place. 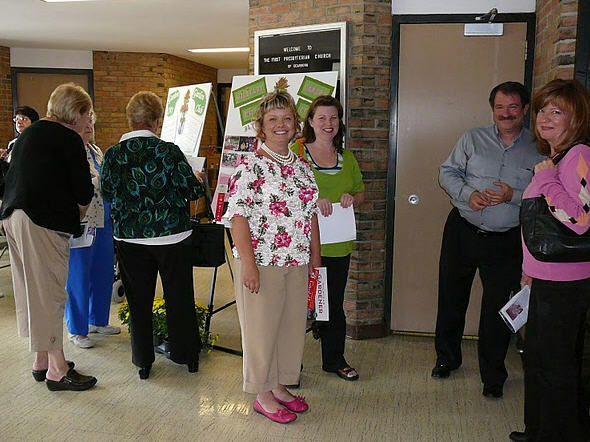 Luckily, I didnt have to worry about that because my designs were judged to be successful! I won! I won a blue ribbon in floral design! I don't look too happy about that, do I? 2. Know the show schedule and read the handbook. 3. Become familiar with the intricacies of each section and design type. 4. Know that judges may have "traditional" eyes. 5. Practice your designs ahead of time. 6. Bring lots of extras. 7. Be willing to help out your competitors. Karma knows the difference. 8. Think about the underlay! A lot. 9. Fill the background, but dont go outside of its boundaries. 10. Press all your fabric and transport it gently. Wrinkles amplify! 11. Go back and read the handbook again. 12. Ask questions, but research and confirm answers given. 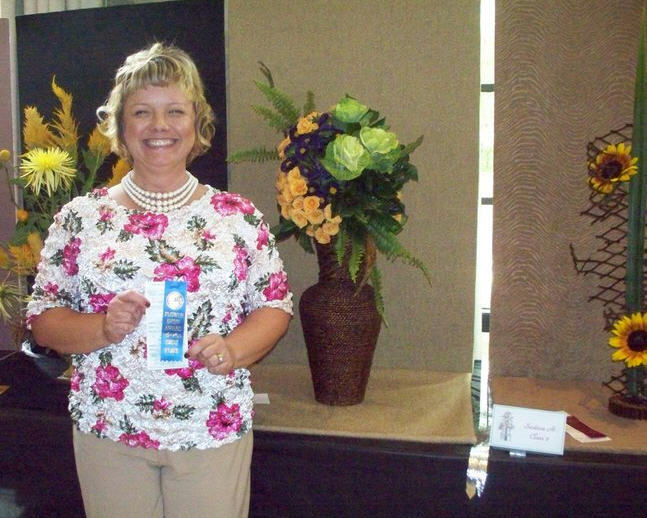 I'm a flower show judge and I think you did great and I like your website. 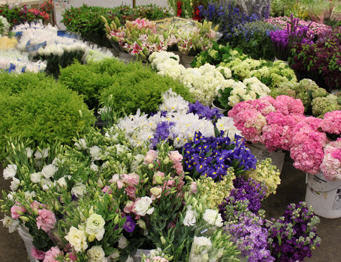 Have you joined a garden club yet? 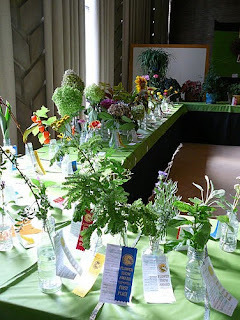 If you haven't make sure the club you join likes to have flower shows.